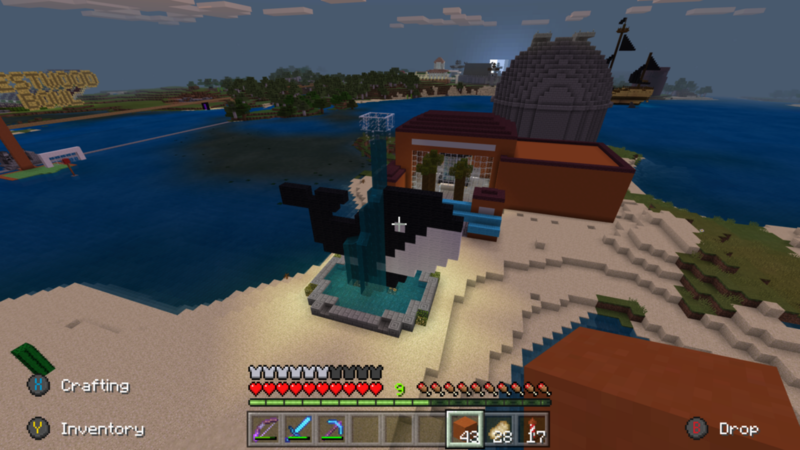 MC Day 12897: Temporarily putting my Ice Spikes base rebuild on hold, I’m about 900 blocks away at my Ocean Monument base, enjoying some of the new features of 1.13. My main thing was to build a simple Turtle Scute farm on the edges of the base, but the precise information on how the mechanics work seem a bit sketchy from the YT vids I watched. But by trial and error I now have a farm which seems to be working OK, the babies hatch, can’t escape till they are adults, when they do the scute they drop is collected in hoppers to a chest (access via the chute to the right of the farm in the pic). And the adults can reach the sand and lay new eggs. Think I may end up with too many adult turtles in the surrounds soon, so might need to go on a cull. Whilst waiting for the farm to work (turtle eggs take 3 MC days/nights to hatch on average) I designed a small Phantom trap to the top of the farm where I could deal with the Phantoms much more leisurely. Nice that they fly straight up when they’ve hit you/been hit. Nearly 5 stacks of membrane now. 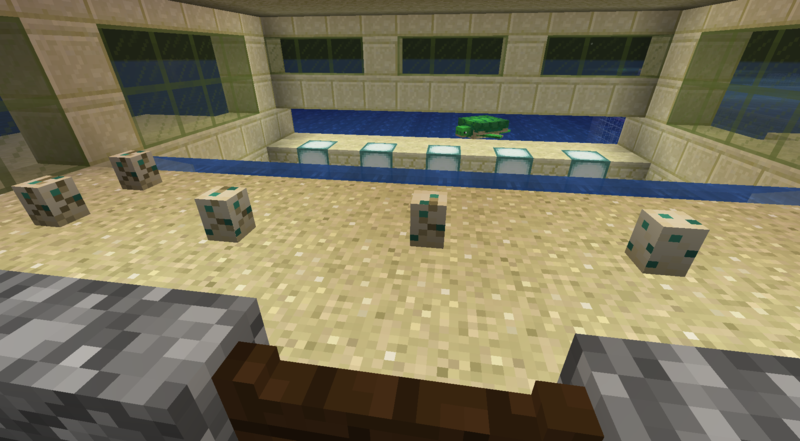 I also modified the zombie villager pods located nearby which feed the cured villagers to my underwater villager trading hall/iron farm. 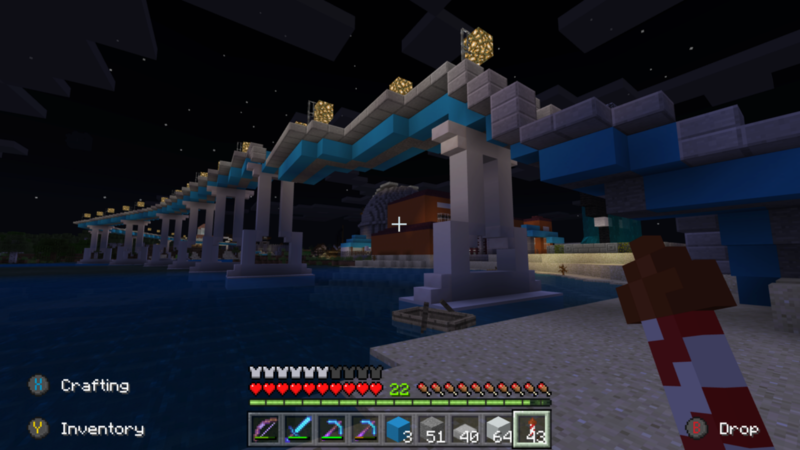 As its in water, I also had to add some bridges from the mainland to the pods (made of blue glass which I placed one block under the water) so the zombie villagers could reach the pods without sinking. 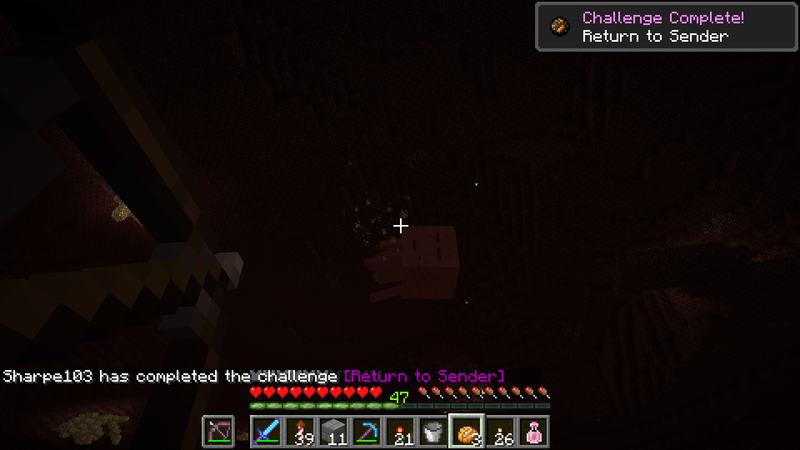 Also I forgot there was a zombie pigman here who was created when lightning struck a pig. 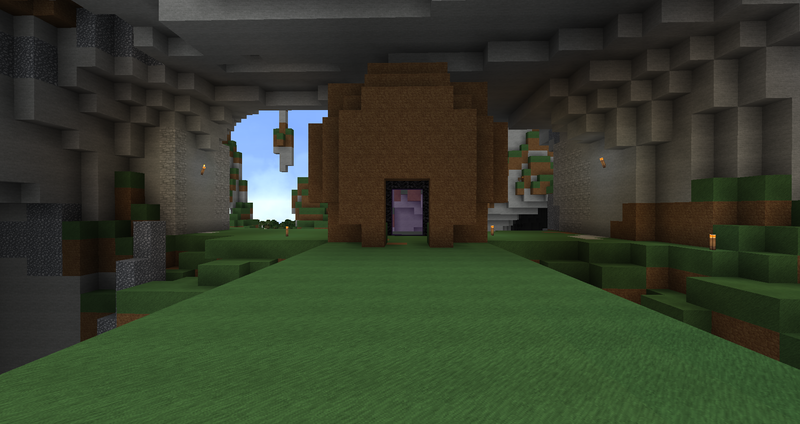 He was walled up in a hole in the ground for more than a year now, so I’ve liberated him, to wander where he will. So after 1.13 came out, I was like, "Aw man! I wish I could experience the new ocean stuff in my best world!" Then I realized, my best world is from before release 1.8, and that I was missing out on A LOT of stuff (like andesite and other stones, and fooling around with re-creations of the seed show that the village near my house is 2 times bigger in the new world generation), so I decided to start anew, but with the same seed. I don't know if that's cheating, since I already know where everything is, but I did it regardless. I'm at day 83, and I got a lot of stuff done. 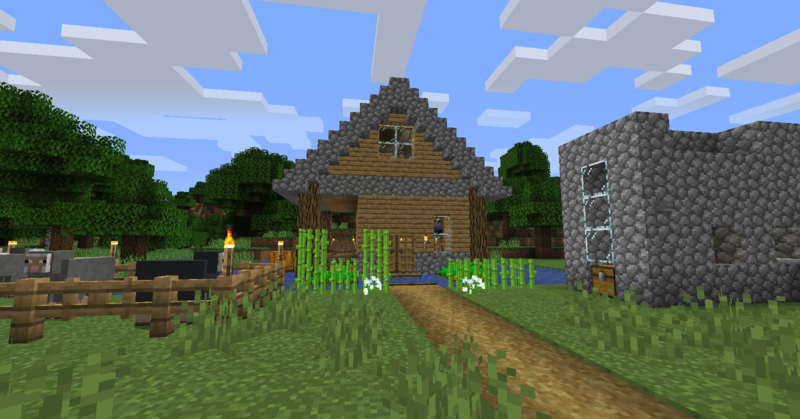 I've made a pretty extensive strip mine, I've made a cool house, I got a automatic (but slow) chicken cooking farm, I went to the nether and got myself some blaze rods and nether wart, I have a storage basement, I have almost every farmable thing (like wheat and potatoes), and I already have decent potion brewing AND enchanting stations. I'm not completely ready to give myself 100% diamond stuff, but at this rate, I think I'll have a full set of (possibly) enchanted diamond armor at around day 120. 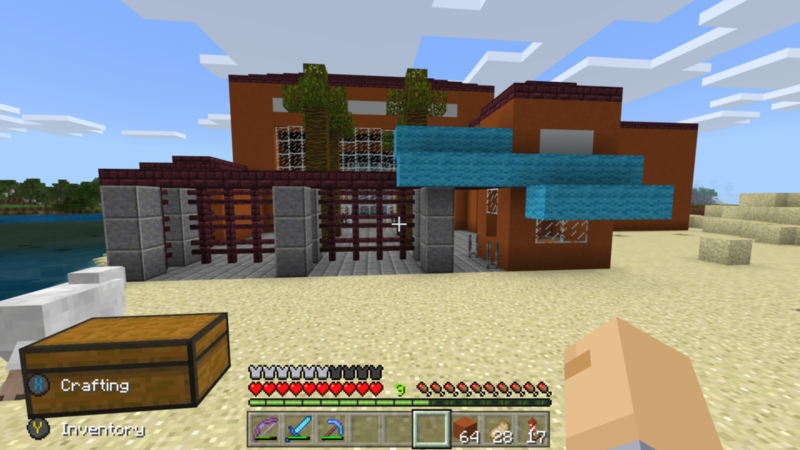 It's kinda messy (I blame the chicken farm), but I like it a lot more compared to the first house I built. Much more roomy. 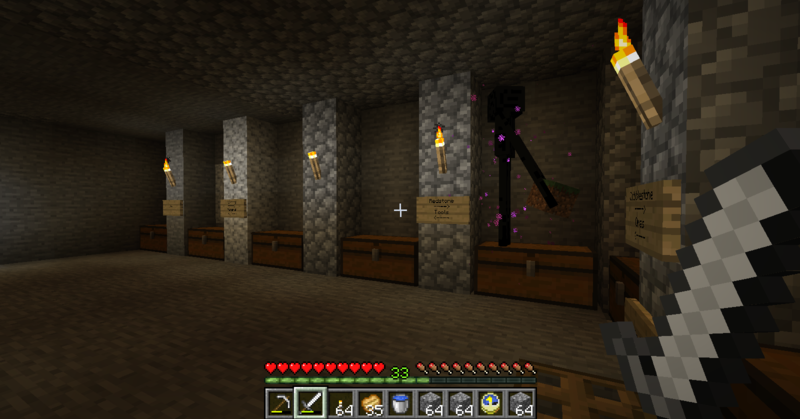 The reason I'm sharing this stuff is to give context on what happened earlier: An enderman teleported in my house!! 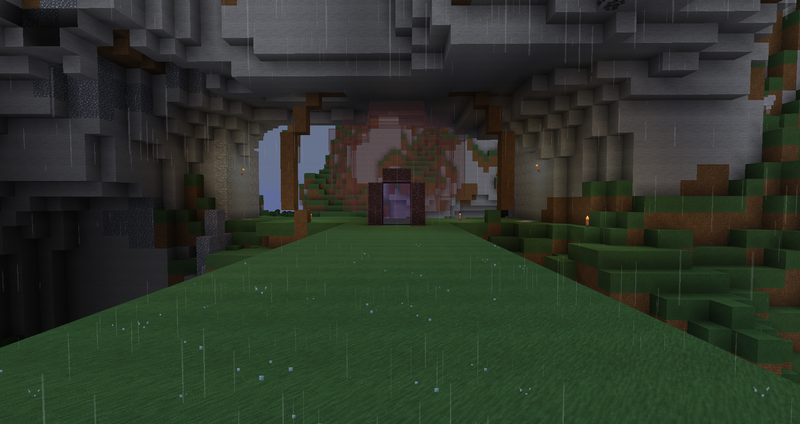 I've heard that endermen teleport underground during the day, so maybe that's why he was there? I don't exactly know why, but I do know that I hate endermen. Ever since I first saw one in Beta 1.8 when I was young, they creep me out, a lot. That scream and the creepy noise after they start attacking you just unnerves me. Not as much anymore, but eugh. 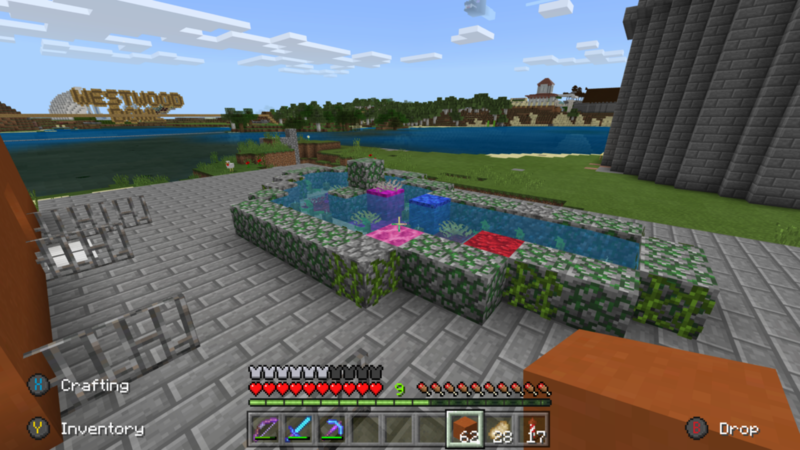 Anyway, he wasn't too hard to kill, and luckily didn't steal any chests since he was already holding a grass block. It's still scary to hear those unnerving sounds, and go down into your basement, JUST to see it's standing RIGHT THERE! You have to walk a bit west until you find plains over a river and bordering a forest to find where my house is. 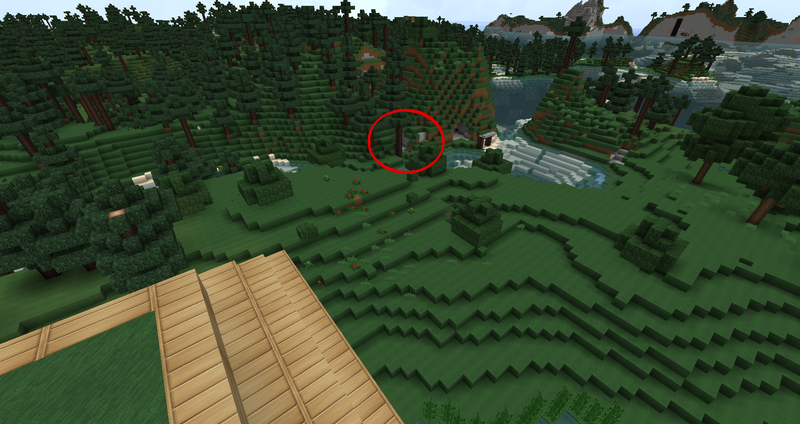 To the right of where I've circled you can see the log pillars of the official entrance. Having dug out the dungeon and made a water trap I got from something like xp level 10 to 24 from it. 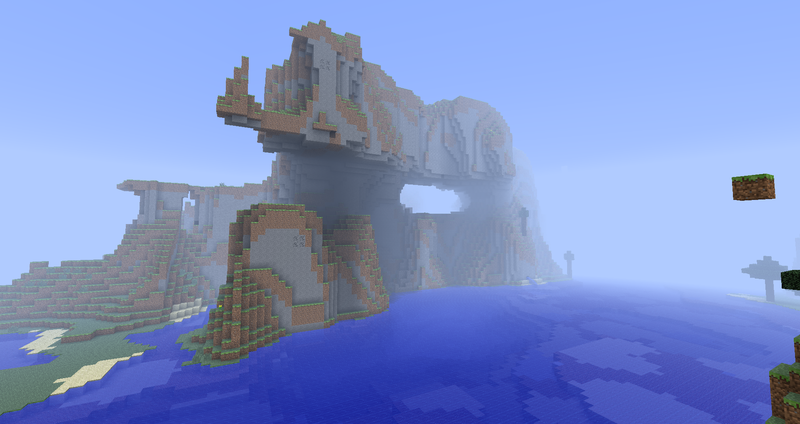 I want those good enchants on this world now. 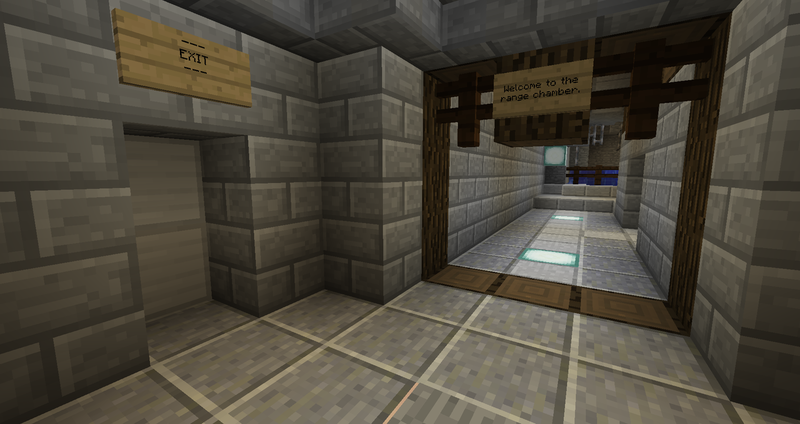 I also remembered that in my mine - inside my home, there is a zombie dungeon, so I converted that too! That one doesn't have hoppers yet though to collect items. I will do something with the spider one soon. I also started another major change. In the old days, I bridged across there making a very straight temporary dirt bridge, I knew I wanted the nether portal there. 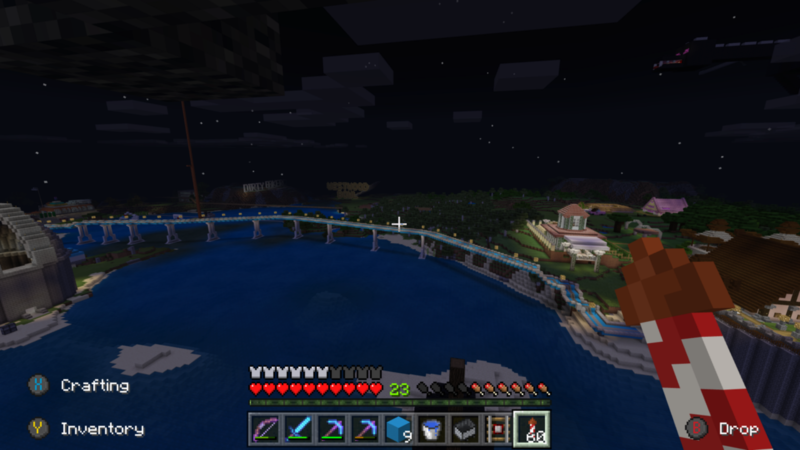 Because of the biome that temporary bridge would always cover in snow. Fast forward and I've actually decided to do something about it and make it more eye like! I got an idea to make an "Iris" in front of the already made portal (From 2011) out of red glass - as it has to be evil! I started with a dirt template and gathered the materials then transformed it. Later I would move the portal more forward in line with it. 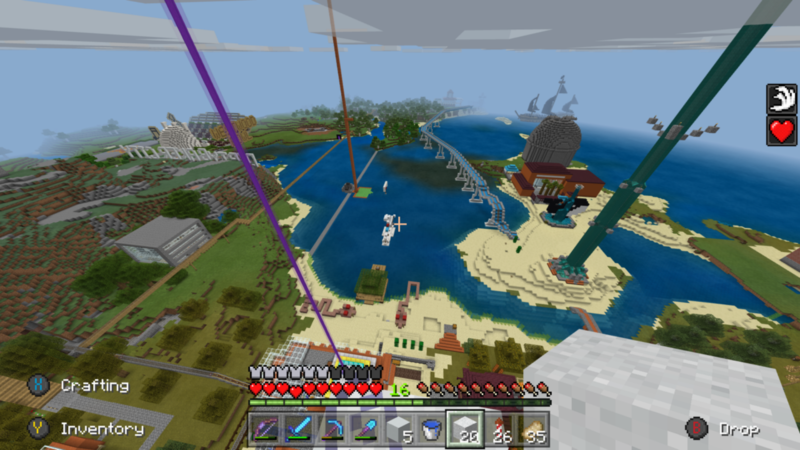 I'm certainly having fun on this world and am enjoying playing it again, and look forward to developing it. Got this place done in 3 days work. +3 hours/day. Really like how it came out. Just have a few more decorating tasks to deal with and the gift shop. Finally finished clearing out an area that contained 5 slime chunks all bordering each other for what will soon be my mega slime farm, woot! Back from a months-long hiatus, and spent a vigorous play session today building and scouting out some new party pets for the base's newest addition: Starlight Treehouse! The build is nowhere close to complete, but it's certainly coming along much to my liking. The finished product will likely take another few months given my pace (that of a sloth), but hey; everyone needs a hobby. Mine is Quintropolis! After trial and error in trying to use Overviewer for hours, I decided to switch to another map viewing program called Mapcrafter, I got it to work nearly instantly with just as good result as Overviewer. I advise against using overviewer, it's just way too complicated. Anyways, here's my little home and a village i've "vassalized" and connected with a railroad. 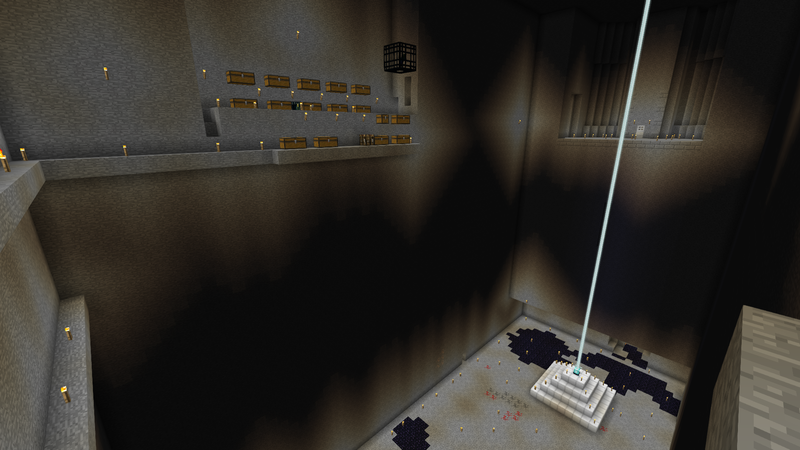 Finished primary excavation of the zombie spawner chamber below my main base, Castle Midgard. I decided to stop at lava level (Y=11) rather than bedrock (Y=5). The ceiling is Y=67. The room is roughly 27x50. I think that's a volume of 75,600 blocks, but it seems hard to believe I mined that many. 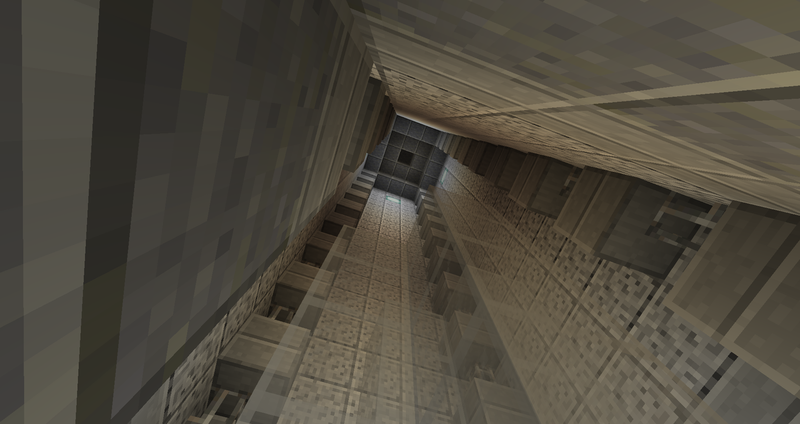 Like the castle's elytra shaft and map viewing area, I expect this room will be dominated by enormous columns (built with about three full double chests of cobble each) and bridges. Even now that I've had plenty of time to consider it, I'm still just not quite sure how I want everything to look and work here. I don't even know what type of floor it's going to have. 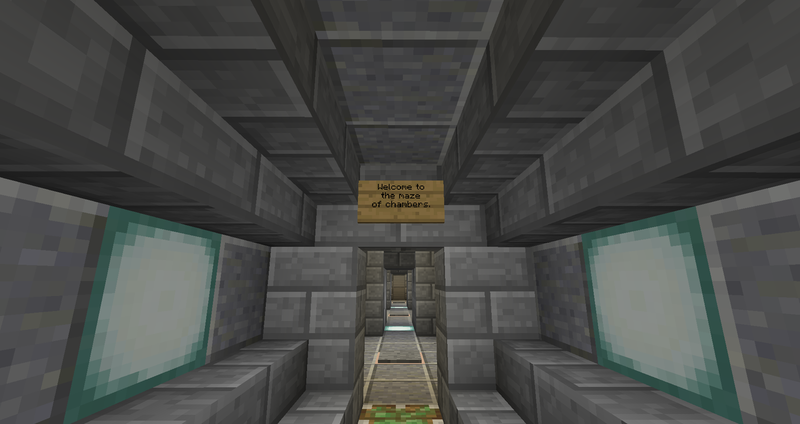 Quintropolis recently celebrated the completion of its fourth parkour course! Titled "Chambers", the course is more of a puzzle and features two distinct sections. The first is a gridlock type of puzzle wherein the maze of doors changes each time you hop on a button inside the grid. Once you figure out how to escape that, you enter the range chamber, where you must use your bow skills in a variety of ways to shoot your way out. Can you escape the chambers? Upon exiting the course, a single pressure plate resets everything for the next time you want to play. Now that I've finished primary excavation of the zombie spawner chamber, I'm moving to the other side of the castle and resuming work on the gold farm, which I've not touched in very nearly a year. Actually, it looks like today is the year anniversary of me starting to work on the farm! What a coincidence. So, I started excavation of the collection chamber. But, before doing so, I checked the portal area out to see if anything looked amiss. I hate creepers, but Endermen almost as bad . . . When I do get round to it, I'll dedicate it to you of course! Haha! 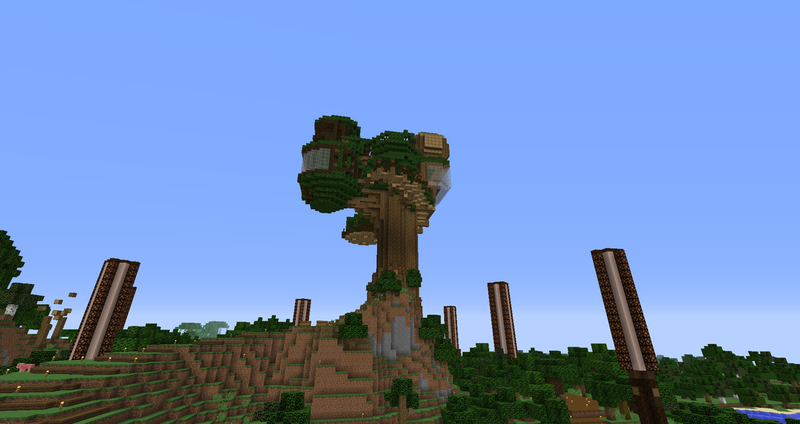 Well, spoiler alert, I didn't actually use the one in the video tutorial, I used Mr_N_Derman's. He cut it out of his world for me to download on my metered Internet connection. So, my gold farm is dedicated to him, and he's much more deserving! I made a farm but then the farm died because I murdered it for fun. It look a long time to get cows into the farm ;( now they are dead. It turns out only one of my Charged Aura Nodes is not working - the one I use to charge wands/staves with. For now, I have two workarounds. For wands with 250 Vis or less, I can use my Recharging Pedestal, which has 25 Aura Nodes around it with a total Vis in each Primal Aspect of around 300. This won't do, however for the one at the Arcane Worktable I use for Ichorium-based items. It holds 1000 Vis, but I can simply use the XP Drain Focus to recharge it should I need to. 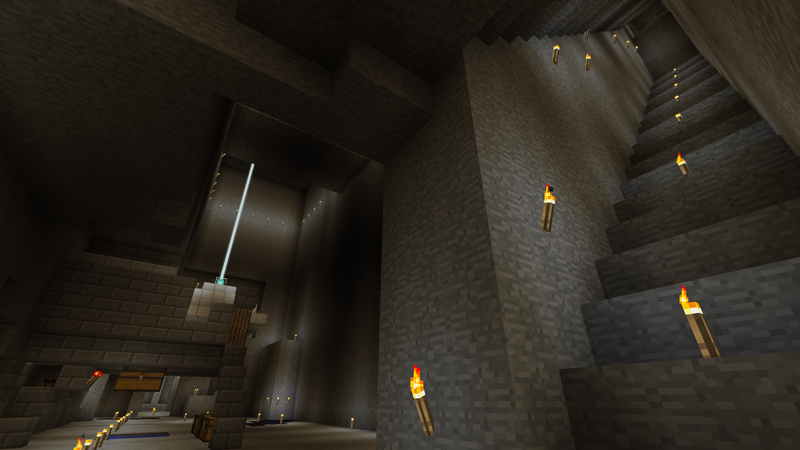 In the mean time, I have now reached the bottom level of my branch mine, Y=12.62, right above where lava starts to form. I've been finding quite a few diamonds, maybe a stack or so in the last few tunnels of the level above and the current one. Having Fortune III on the Iridium Drill really helps with getting more of them. 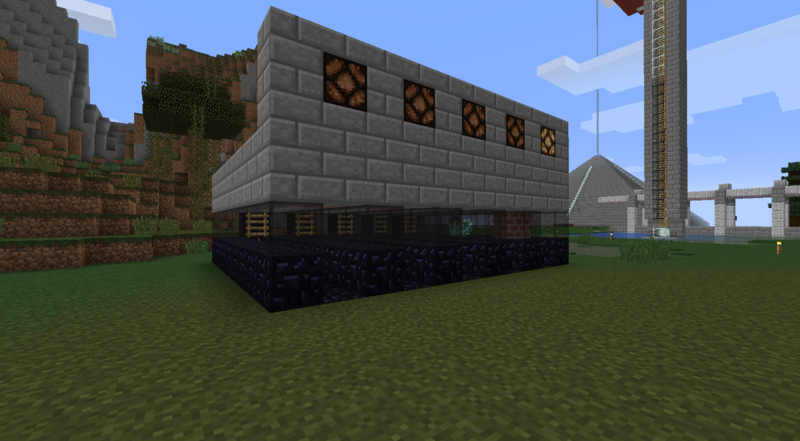 Another thing I have found I need to rebuild is the Advanced Alchemical Furnace. For a few seconds I panicked when I could not find the Primordial Pearl needed to craft it in my AE system and thought I hadn't explored the Eldritch Dimension yet. 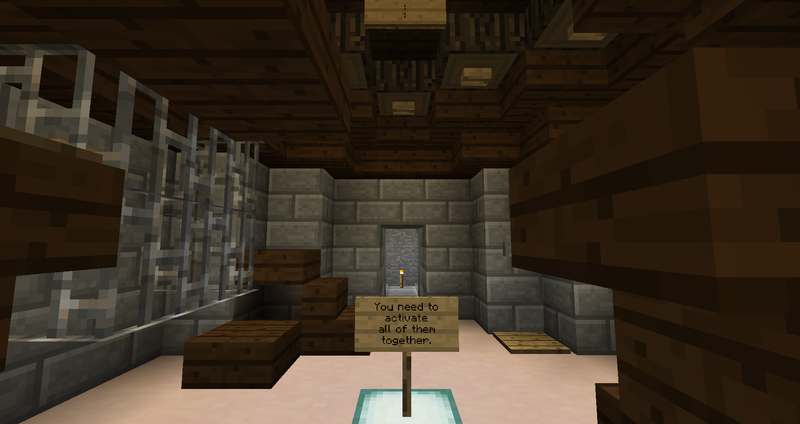 But I put it in an Item Case in my Thaumcraft Room. Then it occurred to me that there was something else I had not done yet, and that was create the Quantum Singularity needed to set up a remote connection to my AE system when I decided to move to a new base. 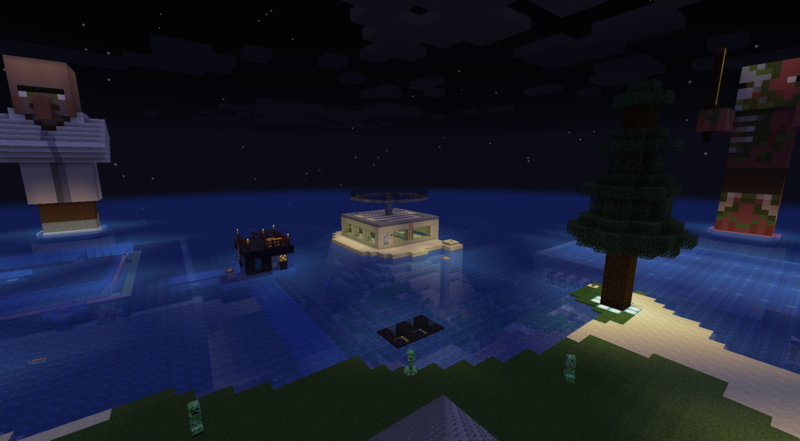 I may consider putting the new base in a different location than where I had started it before. I would also like to go back to the Twilight Forest and fight another Snow Queen so I can obtain the Tri-Bow. 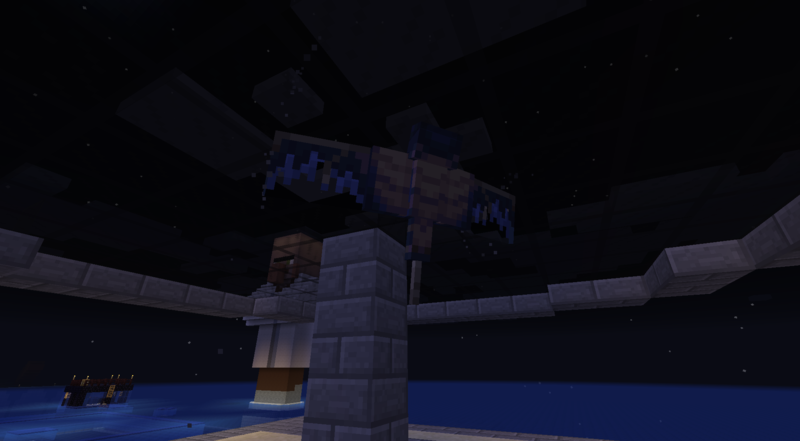 I put the Ender Bow, Seeker Bow and Ice Bow I got from the previous visit to the Aurora Palace on a Tool Rack, next to all the other items I have put there. In the remaining slot I put a bow from Botania, the Crystal Bow. You make this with Mana String, a Livingwood Twig, and 2 Dragonstone, which are made by dropping Mana Diamonds in the Alfheim Portal. Haha! What a testificate won't do for emeralds . 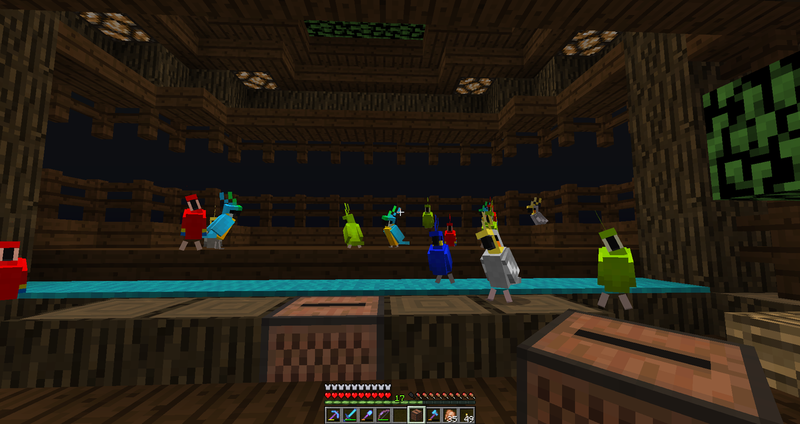 . .
My girlfriend still thinks Minecraft is some sort of matchmaking simulator. No one likes to tear down and rebuild, but as obsidian is the primary building material—and there's a lot of it—I really want to do this right the first time! Well, I just took a good, hard look at the thing. There's one "small" thing I didn't consider . . . Water drops from the above blocks. In the kill/collection area, it's "raining" 24/7. 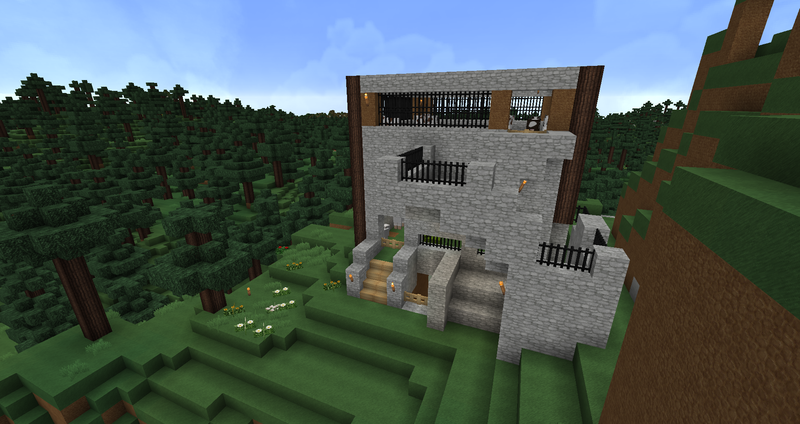 I can't lower it due to other castle features, so I'm going to raise the whole damn thing one block. 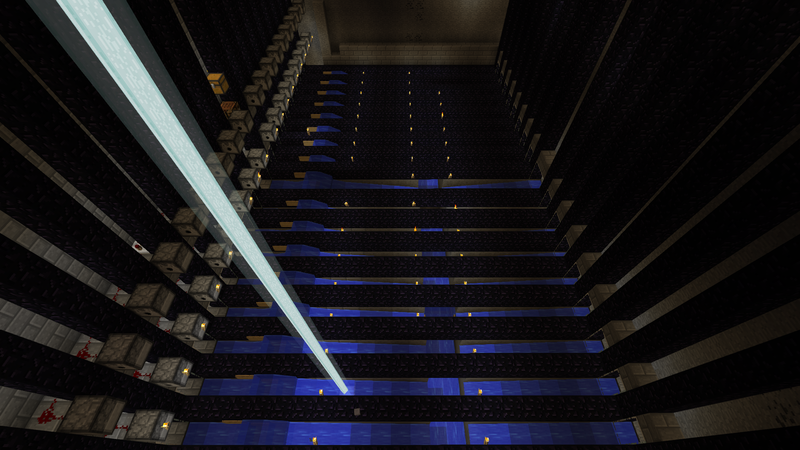 At the same time, I'd like to make some decorative reliefs in the wall beside it, so I need a bit more space, meaning I'm forced to move all the redstone from the east to the west. 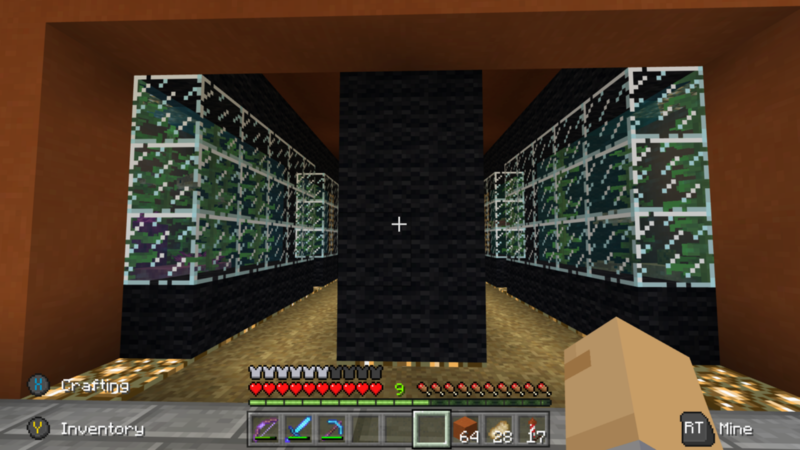 At least—and I don't want to jinx myself here—most of the vertical obsidian will remain. That's why I've procrastinated for a whole year. I've known about this problem the whole time and just haven't been able to make myself break this monster all the way down. 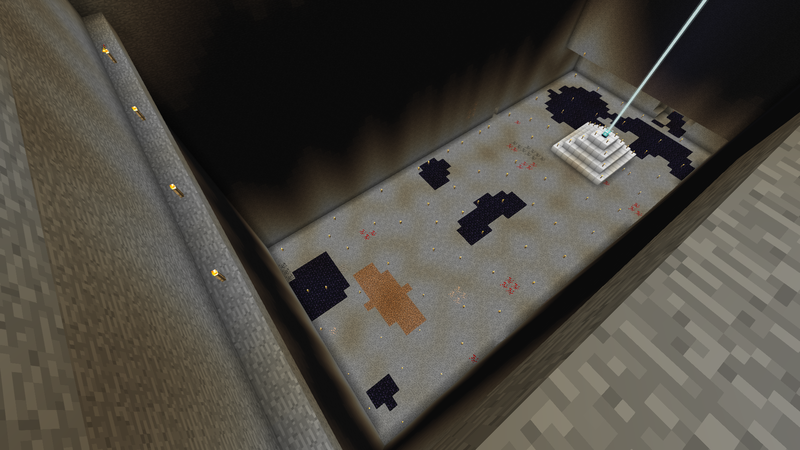 However, tonight, I started to clear out the kill/collection area at lava level (Y=11). (Above) Before. 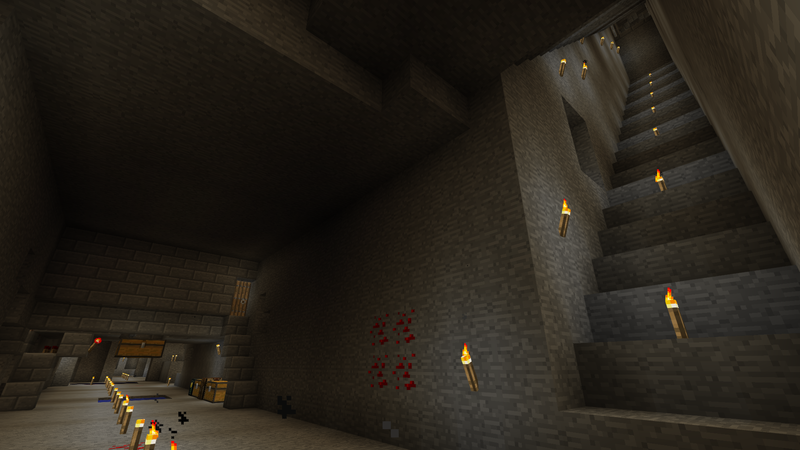 The unfinished stairway is very old, but I didn't want to finish it before the gold farm was complete. That stone brick room houses the hoppers and killing floor. Honestly, a drop isn't really needed now that we have Sweeping Edge. A max-enchant diamond Smite V sword will kill them in a couple hits anyway. Still. 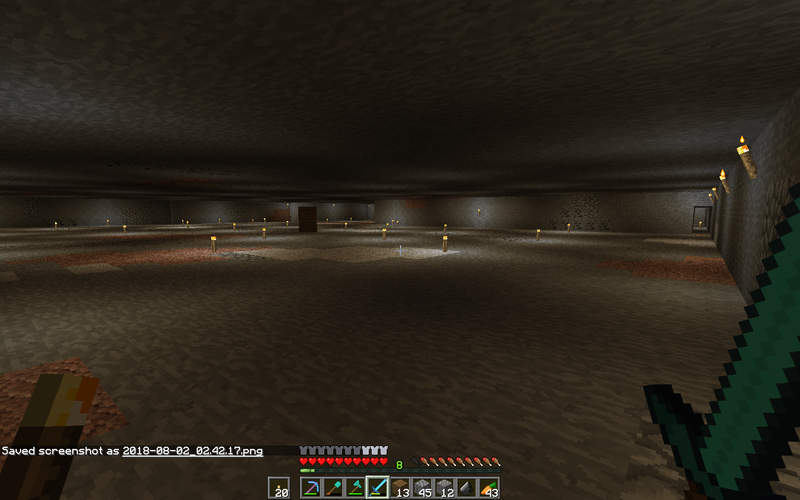 Might as well soften them up and I have plenty of room before bedrock. 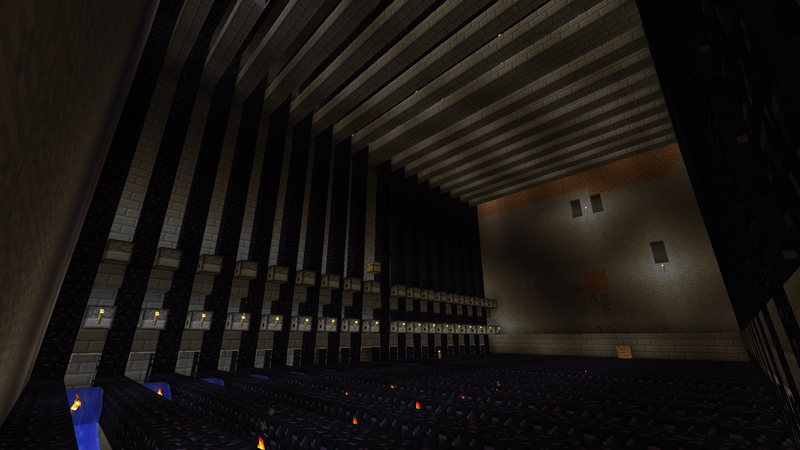 (Above) I should have taken down all those torches on the walls high above. 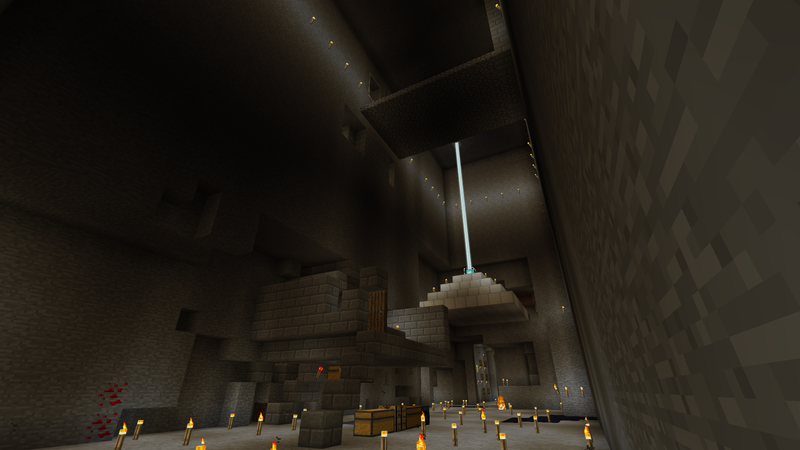 The east wing of the Vault Treasury can barely be seen. 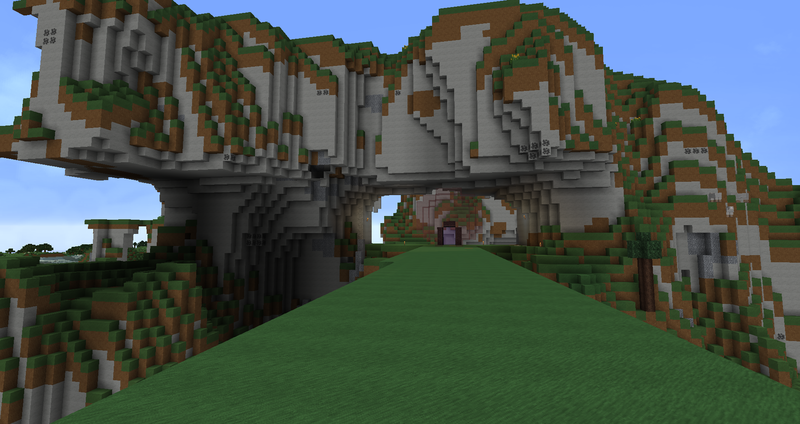 That cobblestone slab bridge leads from the antechamber to what will be the AFK area. 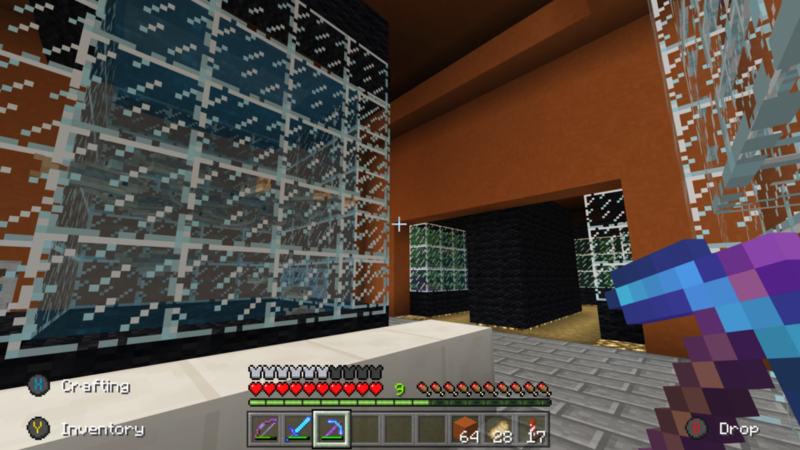 Water drops from the gold farm above are an annoyance and I can't even slab the ceiling. It just won't look right from the antechamber. This is a massive and important area of the castle and there's no reason not to do it right. 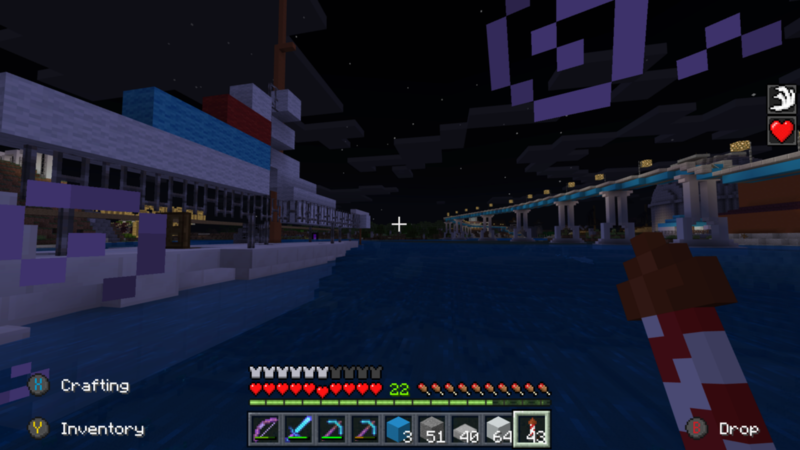 I may not be able to play Minecraft for another week or so. I'll just be too busy, I believe. EDIT: Extended my play session a bit since it might be my last for a while. 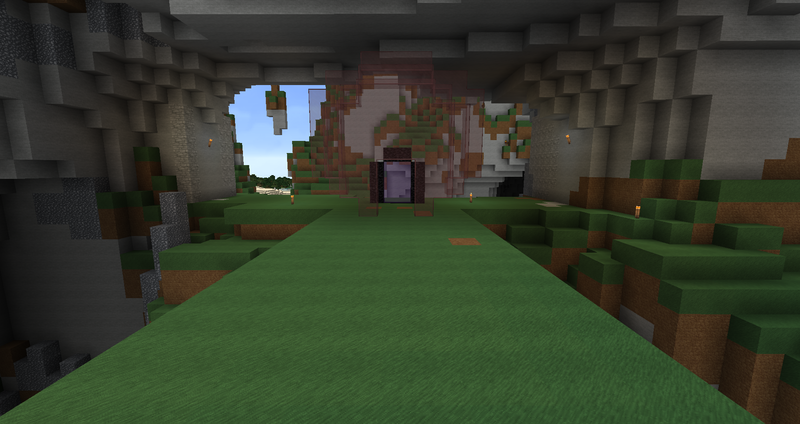 Raised the bottom of the Nether portals and tested them real fast. Of course, that meant I had to clear them out. I don't think they were on but for perhaps a minute and I got nearly a stack of nuggets killing them all. After that, I activated the portal in the nearby antechamber and stepped through, hoping there wasn't a small army of murderous pigmen on the other side. 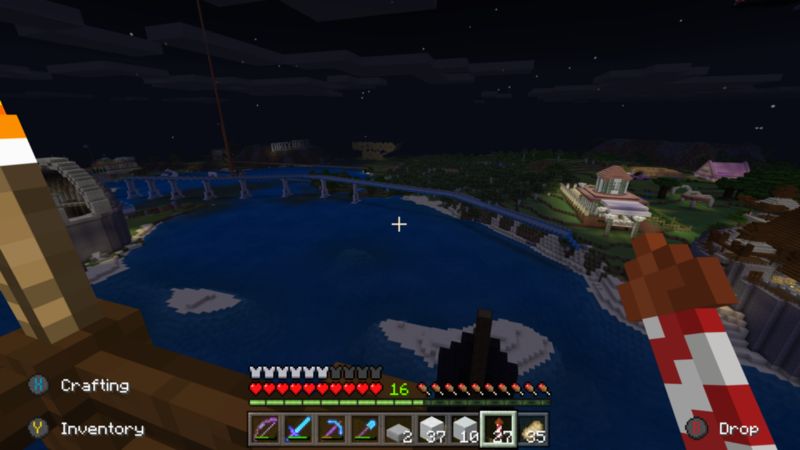 It's super late and I'm tiered, so I didn't want a repeat of the last big battle at Thermopylae, the Nether outpost that's connected to Castle Midgard. There were none. Great. So, I should return to the castle . . . Though I was poorly equipped for safe travel in the Nether, and very much against my better judgement, I took off and rocketed to the Nether fortress. Just a quick little spin to relax. Moments later I'm hacking through wither skeletons atop the fortress and dog fighting with ghasts above the hellish sea of fire and lava . . . 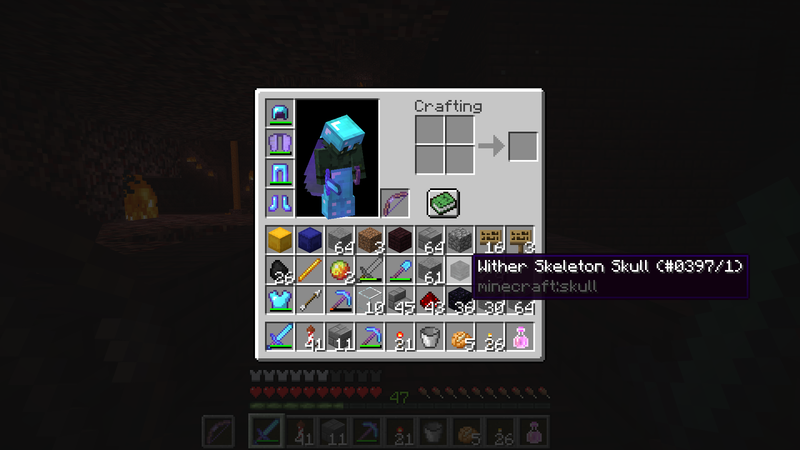 I did get a wither skull, though . . I've gotten it before in this world, but what I liked about this time is that I was flying and I hit its fireball with an arrow! Is "woot" still in use? Never was much a fan of it. 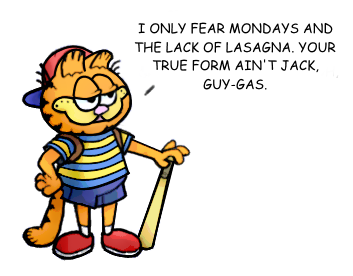 What do the kids say nowadays? "Yeet?" Is that the expression? I'll raise the top of the portals at some point. Can't have a 4% drop in production, now can we? I have one last block to raise . . .
Glad to hear you tested it in 1.13. I know my skeleton XP farm won't work now that skeletons sink. I'll have to retrofit it later, but this farm is, as you know, far superior. Just wanted to do some update on my town that im trying to build and the advances are going pretty good even if i dont build everyday because i get burnt our very fast ... i do 1 build and thats it for a few days maby a week. 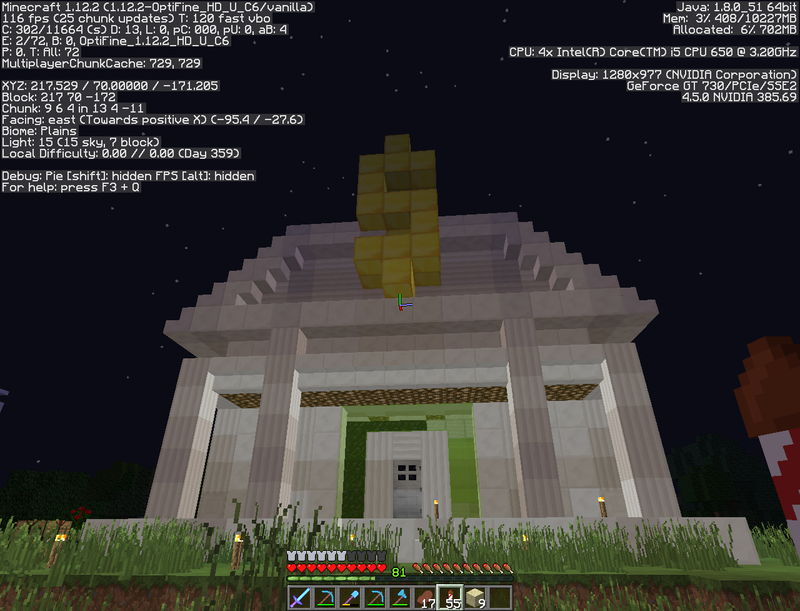 So lately i have made a bank in my town , was an easy build considering i made if from a youtuber desing but i like it. 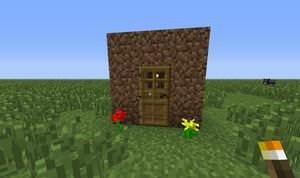 I am not a good builder so i need ideas. And right after that i had a bold idea.